Are you in the market for a new tent for camping, hiking, or even tailgating? Would you like to find something you can easily put together with or without help from someone else? Or are you looking for a tent that even the kids in the family can get involved helping set up? If any of this sounds like you, we’ve got you covered. Check out the information below to learn everything you need to know and much more about the Pinnacle Quickset Tent. This product is sure to give you all the features you’re looking for and more, and we will break it all down for you here so you can find out whether or not it’s right for you. What are the benefits of having a quickset tent, anyway? Isn’t it the same thing as any other tent? Basically, this tent functions in a slightly different manner than pop-up tents, but it can be set up almost as quickly. It’s a little sturdier than a pop-up tent, and it’s lightweight too. There are a lot of great reasons to have a tent like this on hand for your next outdoor adventure, so be sure you take a look at our complete list of pros and cons below. Whether you’re the type of person who loves to go camping on a regular basis or you prefer to make it a once-a-year trip, you’re sure to be able to get tons of use out of a product like this one. Read on to learn more! The Pinnacle Quickset Tent is a high-quality and durable tent that’s great for camping and hiking as well as any other situation in which you might want a tent on hand. The tent is big enough to sleep two or three, depending on the size of the individuals in question, and it’s lightweight enough that it won’t be too much of a burden when you take it along on your next hiking trip, either. It has tons of built-in features to make it more durable and easier to use than ever before, and it sets up in just a few minutes so you can be sheltered in no time. This tent has a built-in rain fly that attaches to the outside of the tent via poles and functions like an umbrella. This makes it easier for rain to roll right off the sides rather than seeping into the tent itself. The tent frame is made of fiberglass, which makes it much more lightweight and easier to carry and set up than some other options out there. The tent frame has a locking design that keeps it in place more firmly and securely than some of the other types of tent pole setups out there, as well. Our favorite aspect of this tent is its double-layer design. It feature a suspended frame sandwiched between an inner and an outer tent, and this is an excellent design that helps keep everyone inside cool when it’s hot out and warm when it’s cold out. This is also a great way to prevent leaks and other damage from occurring during storms, wind, and rain. Best of all, even though the tent is double-layered, it is not too heavy and this double layering design doesn’t affect how quickly and easily the product can be set up and taken down, either. 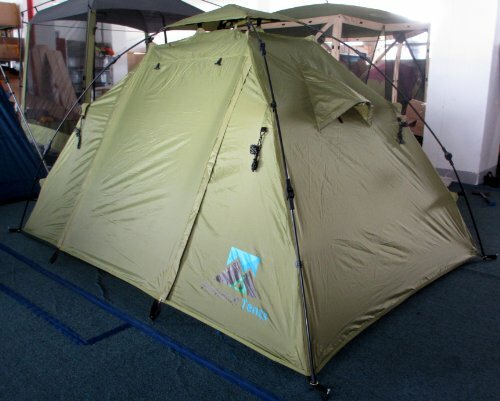 We feel that the best improvement for this tent would be to offer it in different colors. While not all type of tents are available in different color options, we think that could be a nice selling point for any product like this. After all, not everyone wants to go camping in an army green tent, and families especially may prefer to have something a little more fun and whimsical on hand for camping vacations. Because of this, we think having a few more color or pattern options could go a long way toward making this tent even better. This tent has a zippered front door that can be rolled up or down as needed to make it easier to get in and out of the tent and to protect anyone sleeping inside. The tent has vents on both sides to help improve the airflow overall. It is possible to close one layer of the door and leave the other rolled up for times when you need breathability inside the tent. The tent features a bathtub floor that has sealed seams and is sure to keep everyone dry and warm inside. The tent has been known to arrive with some seams out of place or missing entirely in some rare situations. This tent doesn’t come from a very well-known company, which can be a downside to some potential customers, depending on how much name brand products matter to you. The tent’s side flaps are not true windows and don’t allow in any lighting, and they may also be too small to keep things breathable enough in very hot weather. This tent can be hard to find replacement pieces for if anything should break, and it can be challenging to get ahold of the company for replacement pieces, too. As you can see, there’s a lot to keep in mind when you’re determining whether or not you want to bring home a tent like this one. This type of tent isn’t for everyone, but it may work out well for you depending on your needs and the type of use you’re looking for. But is this really an easy tent to operate? How fast can this tent be set up and taken down, anyway? This is not a pop-up tent, so it does take a little more effort than just opening it to set it up. However, it can still be completed in just a few minutes, and tear-down process is not much more challenging than this, either. It doesn’t take long to fold everything back down and get it tucked into its carrying bag, ready for storage or another big adventure. With that said, however, it’s always important to make sure you’re careful with tents like this while setting them up, to prevent damaging the rods or tearing the fabric. With a little extra care, the setup process may take a couple more minutes, but the tent itself is more likely to last for a long time to come.